Mega Man 10 Retro Review – Buy Mega Man Legacy Collection 2 Now! With the advent of Mega Man 11, I went ahead and decided to play Mega Man Legacy Collection 2. Specifically, that game was Mega Man 10. Despite beating the title in 2010, when it first came out, I never touched it again. It felt like another good, decent Mega Man game. Ultimately, however, my interest was completing the game so I could say I’ve beaten all ten games in the main series, as well as Mega Man & Bass for GBA. Mega Man 11 – New Trailer and Amiibo Edition Revealed! That being said, I contracted a bit of Mega Man fever after watching the trailer for Mega Man 11 yesterday. Watching the trailer made me want to get back into that retro goodness and play the games of a gone-by era. To think that Mega Man would return in 2018 is something no one was ever predicting. But with that October 2nd release still just over four months away, I needed to get back into the action. The question was which game to play? Mega Man 2 and Mega Man 7 have always been my favourites. I’ve replayed 1-6 many times, but 2 was the one I always came back to. I only have fond memories of hating everything about the final boss of Mega Man 9. With that said, my attention turned to the latest release in the franchise – Mega Man 10. What makes Mega Man 10 special? I booted up the game on my PS4. With my copy of Mega Man Legacy Collection 2, I own Mega Man 7-10. That said, it’s the definitive version of the game as it includes all DLC (unlockable with a code) and various challenges. Despite being the latest entry in the game, it follows in the footsteps of Mega Man 9. As opposed to upgrading to high-definition visuals and modern-day technology, Capcom opted for the classic 8-bit route. They chose this as they felt it would be most appealing to the nostalgic fans of the NES Mega Man series. Despite this, the game’s visuals hold some nice animations in the backgrounds. One thing special about Mega Man 10 is the soundtrack. Every track in the game is composed by someone who worked on a previous Mega Man title. Among the names include Ippo Yamada, Ryo Kawakami, Yuko Takehara, Yasuaki Fujita, and more. To hear all of the Mega Man sound staff come together to work on one, classic chiptune soundtrack was nothing short of magic. Given the eclectic styles of Mega Man on NES, SNES, and even GBA, there’s a favourite for everyone. My personal favourite is Pump Man’s Theme. If you’re interested in a full list of composers, feel free to check the list here. 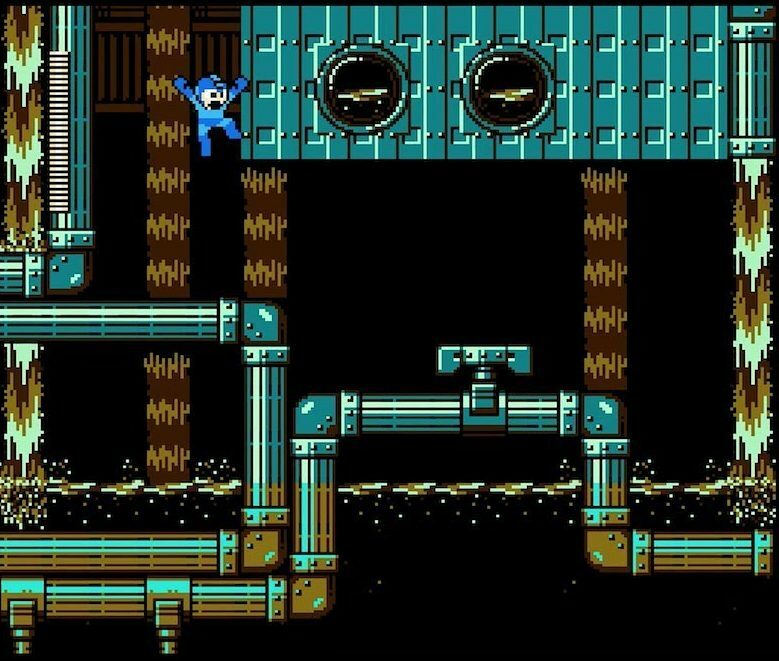 How does Mega Man 10 hold up today? In the past, Mega Man had great stage design and some bad stage design. Some of the bad ones included getting knocked into spikes and dying (MM1), the turret boss that requires you to have full Crash Bomb ammunition (MM2), the lopsided difficulty of the Robot Master clone stages and the Wily Stages (MM3). And let’s not forget “JUMP! JUMP! SLIDE! SLIDE!” from Frost Man’s Stage (MM8). Mega Man 10 balances itself well. It includes an Easy mode for newcomers and more casual players, as well. The Normal mode is plenty hard. Perhaps it’s harder than the original games at some points as well. The bosses are a mighty challenge, especially without the weakness weapon. This forces you to recognize their patterns or die trying. And yet, once you get their patterns down, they’re as easy as any boss could be. Fortunately, you can unlock a Hard Mode when you beat the game. You can also play as Protoman, Bass, and unlock the various Challenges, too. I’m fond of the clever stages designs. The coloured blocks that disappear, the mouse-click cursor enemy, the final stage with gravity, and more. There are tons of traps and various platform elements that go beyond just hopping back and forth and defeating enemies. The reason I bring this up is that I recently beat Bloodstained: Curse of the Moon. While it brings back that retro 8-bit charm, I still find it to be a 7/10. Despite being a good game, I don’t find any of its level choices particularly stand-out. Not like certain parts of Castlevania III, let alone Super Castlevania IV. Mega Man 10, on the other hand, didn’t fail to innovate, however. While I feel the 8-bit visuals were meant solely to cash in on nostalgia, it wasn’t limited by its aesthetics. I do wish there was a Slide and Charge Shot option, though. I feel purposely limiting the game for the sake of simplicity and nostalgia also ended up being its main flaw. Mega Man 10 is a great game in its own right. It separates itself from the other nine titles by using modern conventions in a classic-based game. It feels well-balanced enough for casual players to enjoy and challenging for veteran players. The game doesn’t fail to bridge the gap with its clever stage designs, tough boss battles, and extra content. It’s more than just your run-of-the-mill Mega Man platformer. It honestly feels like it balanced everything else, giving it solid points across the board. If you’re interested in checking out Mega Man 10, you can purchase Mega Man Legacy Collection 1 + 2 today on Nintendo Switch. I recommend this version particularly because both sets are included, giving you the full ten games. As this is the last game in the series before Mega Man 11, I highly recommend playing this. If you’re new to the series, MM10 is not a bad place to start. It will give you an idea of the modern conventions used for the game’s challenge that will almost certainly appear in Mega Man 11. Be sure to check out the rest of the Mega Man Legacy before you dive into Mega Man 11 on October 2nd! Thank you for reading our Mega Man Legacy coverage. Did you enjoy the Mega Man 10 review? Let us know in the comments below. Previous Post« Previous Captain Tsubasa episode 9, who will win? Shuutetsu vs Nankatsu!